Mr. Snuggles had to die. To the outsider, Mr. Snuggles might look like an innocent cuddly stuffed toy of almost unbearable cuteness, but he had a dark secret. Now that he appears to have finally stopped twitching I shall unleash the aforementioned dark secret upon the world. …well, if not the world, then at least the first 14 cells of ward B19. 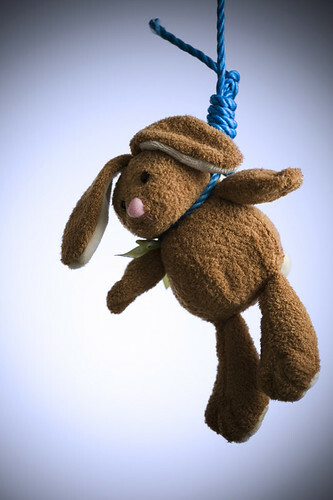 As harsh as the punishment might seem, Mr. Snuggles had it comin’. Hell yeah. Whoah. I was eating my daily allowance of marzipan when there was a knock against the Kevlar-reinforced security glass window of my cell. It was Mr. Snuggles. He was grinning like a maniacal fool. I saw blood on his delicately woven paws. It looked like my blood. It was red. It was a bit gloopy. Surely that’s no coincidence? So how did he get my blood on him? I did a quick search for cuts or critical wounds. That had to be my blood though. He must have wounded me at some point and then delicately tended me back to full health with my blood kept fresh upon his paws with an ice pack. Nothing else for it. I moved like a badger on steroids and he was noosed within 34 minutes of polite debate. Death to bunny blood spillers!